This Fine '59 Galaxie Makes The Grade As A Cleanly Restored Ford. Ford aficionados maintain a special place in their hearts for the redesigned ’59 line, which was promoted as having “Thunderbird elegance.” The brightest light in the stellar lineup was the all-new Galaxie, intended to compete with several rivals, primarily Chevy’s popular Impala. 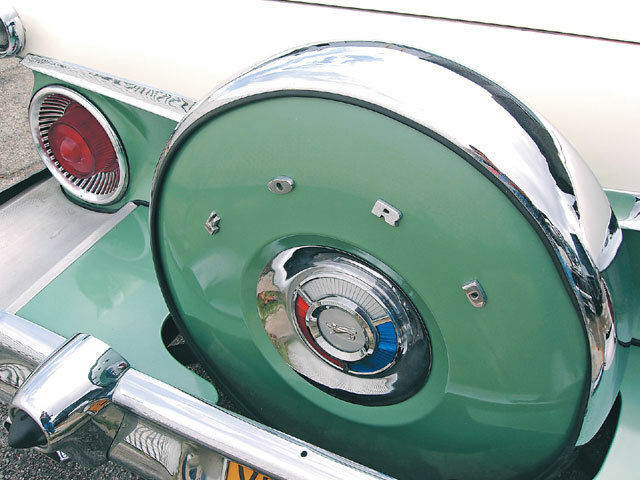 The most memorable of all ’59 Fords (and the most valuable to collectors today) was the Galaxie Skyliner, which featured an all-steel retractable hardtop that would gracefully move into the trunk to transform the car into a convertible in 60 seconds. 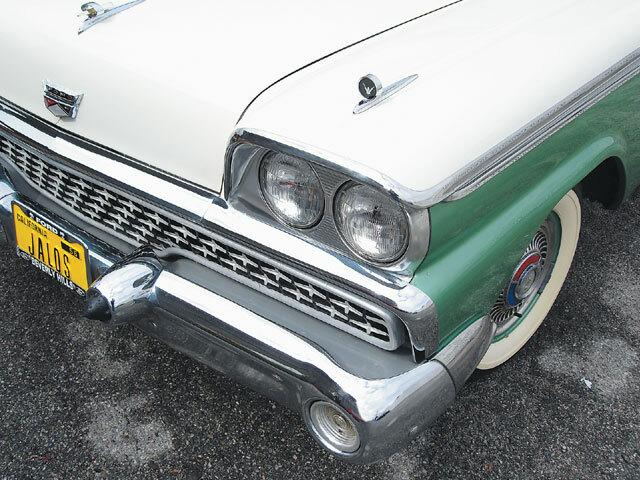 The ’59 Galaxie was very well-received from the beginning and the marque continued to evolve with many beautiful models built over the next decade. One appreciator of the ’59 Galaxie is Armando Aguirre of Pico Rivera, California. A member of Lifestyle Car Club, Armando is a true blue Ford fanatic. 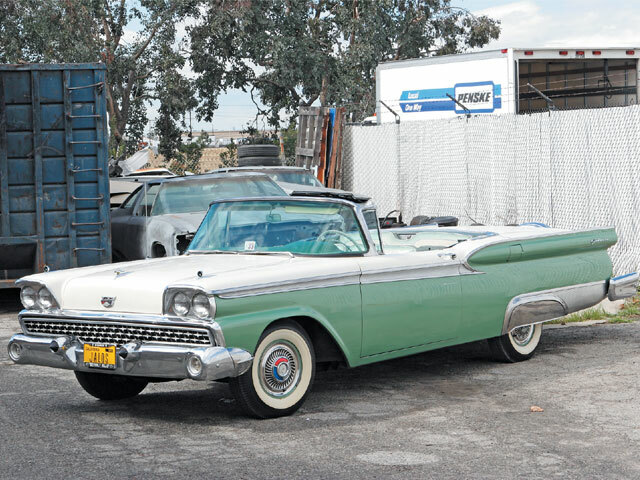 Seeing a Ford in his future and knowing that a ’59 Galaxie Skyliner was “becoming rarer to find,” he reached for the stars when this particular two-tone mint green and white ’59 was found in Palos Verdes, California. Armando spent the next year restoring the ’59 to better than original condition. Helping him out were his two Chevy-loving brothers “Ziji” and Caesar, working out of Camino Real Collision Center in Pico Rivera. 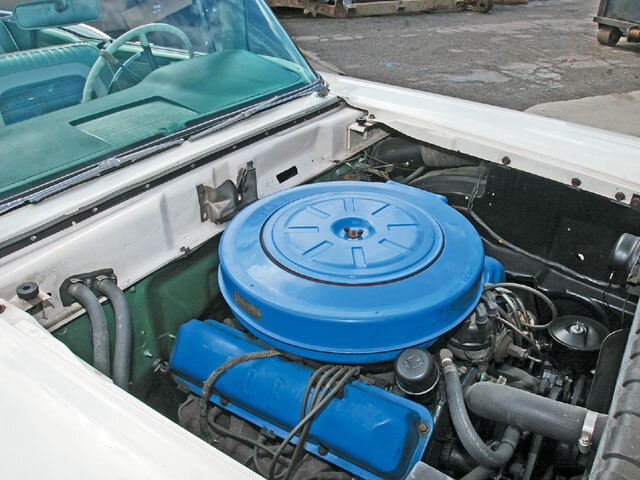 Though his brothers don’t share his love for Fords, they did their best on Armando’s ’59 find, performing considerable “R&R” (replace and/or restore) work on the body, engine and suspension. As a result, this Galaxie is once again an out-of-this-world space age superstar car. Engine/Drivetrain: The stock 352-c.i.d. Ford engine/Cruise-O-Matic transmission combo was fully restored by Armando’s brother “Ziji” at Camino Real Collision Center in Pico Rivera. 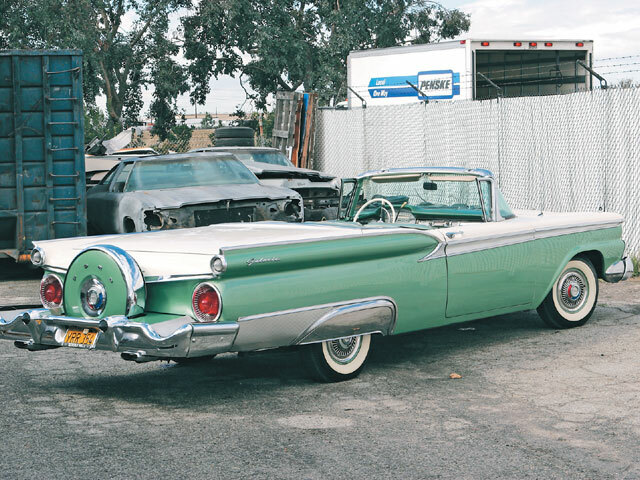 Body/Paint: Armando’s other brother, Caesar, the owner of Camino Real Collision Center, resprayed the original two-tone mint green and white color scheme using DuPont paint.